At 23, I was on a crash course for an early heart attack. Each night, after fits of sleep I would wake up with chest pain, anxious about the next work day. This intense anxiety was the result of a major conflict I wrestled with. I needed to interact with people who seemed oblivious to issues I felt were vitally important. Though putting in 60-80 hour weeks enabled me to get a lot done, it still seemed clear that I was barely scratching the surface of my potential. I realized that if I continued in this manner, I could seriously jeopardize my health and well-being. These days, life is very different. I’ve cofounded four successful companies and have a couple more about to launch. I’m an angel investor for several more companies — some of which I help manage and actively advise. Each day I exercise and read for several hours. Oh, and did I mention that I’m a proud father to a three-year old? This may sound unbelievable, but I rarely work more than 40 hours a week. Honestly, I am no less intense, but I experience almost no stress. I sleep through the night and am a relatively happy and relaxed guy. How is this possible? What changed? Well, that’s precisely what I’d like to share with you. This “aha moment” helped substantially change the trajectory of my life in a positive direction. It can change yours, as well. In fact, I believe increased awareness of the concept I’m about to describe can change the world for the better. It may sound counterintuitive — but once I realized I couldn’t do it all, I was firmly on the path toward better health and increased productivity. I could certainly try to do more myself, but doing so garnered dramatically diminishing returns and led to burnout. It was difficult to face, but I realized I needed to get things done through others. I quickly discovered that was only half the equation. You also need people to be willing to allow you to get things done through them! But, how does one do that? I struggled with this question for nearly a year. It seemed that every attempt I made to impose my will on others was met with resistance and resentment. Ironically, this created more work for me because I had to deal with the fallout from these attempts on top of the existing workload. Luckily, I found DiSC. This led to my epiphany. From the moment that I had started to internalize the concepts within, my life began to dramatically change. My DiSC pattern is “Developer” (7-3-1-4, for those familiar with DiSC Classic). 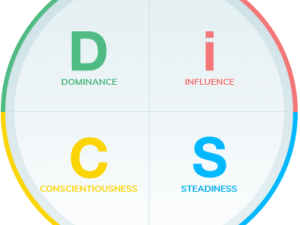 I’m a super high-D, with some I and C, but virtually no S. As I began to study DiSC, I realized that the majority of my problems stemmed from an intense drive to accomplish things (D shining through), but a general dearth of the empathy necessary to really lead others effectively. I needed to boost my S even though it wasn’t my natural strength. DiSC helped me to better understand the motivations of those around me. I read books about mindfulness and being present. To help me smooth off some rough edges, I would even ask a high-S to preview emails before I sent them out. My motivations have never really changed; I still want to get stuff done! But I had learned that in order to do so, the people I worked with needed to feel valued and happy. 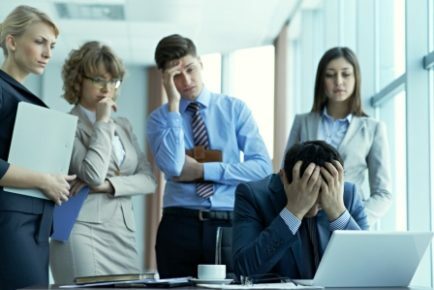 A high-S / low-D personality might be eager for the team to be happy and understand that the organization needs to get stuff done so it generates a profit to make payroll. While the motivations might be very different, both approaches can lead to the same outcome. And, that’s okay. Since that time, I’ve put a lot of time into studying the DiSC profiles of myself and others. Now, I look for opportunities to learn, grow and gain consensus. It has not been easy — but it’s been an incredibly insightful journey. Once I realized that a bulk of my problems were a result of how I approached interactions with others, I had the ability to change course. By adjusting my behaviors, I was able to transform into a more respected and appreciated leader. Sometimes I find myself helping to defuse a conflict or solve problems caused by folks who may not have taken the time to understand why they do what they do. A classic example in tech is the high-DC (Creative Pattern) engineer who is more concerned with being right than helping his “opponent” achieve something great. Another common case is the high-C who underperforms because he’s mired in analysis paralysis. Yet another can be the high-S who is hurt and preoccupied by words they perceived as incredibly insensitive. Because everyone at my companies knows about DiSC and usually have their DiSC profile in a centralized place for everyone to easily access, I tend to resolve these conflicts by reviewing the profiles of everyone involved. 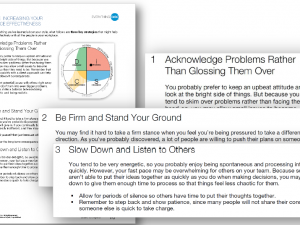 We start by understanding how the perception of a conflict arose based on their DiSC profile. 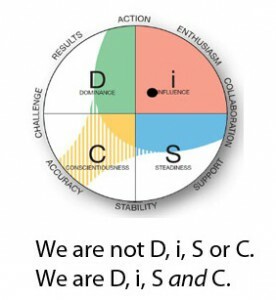 Then, we work to understand the perspective of the others involved based on their DiSC profiles. Here comes the real magic. Next, I try to help the aggrieved party feel empathy and/or sympathy for the perpetrator. Each of our particular, unique patterns come with strengths and liabilities — and these are often two sides of the same coin. Consider a high-I who rarely opens your email attachments but often regales you with a 20-minute account of his weekend on Monday mornings. Well … those traits might also strongly imply that he’s a great salesperson! How about a high-DC systems administrator who likes to argue? She could be the exact person you want managing your company’s IT infrastructure — because very likely she is organized, methodical, and passionate about doing things right. Now, I help people see the other side of the equation and understand that there is usually no real malice in their actions. Beyond coaching folks in effective feedback strategies, I try to have similar discussions with others involved in a conflict. We talk about how their behavior and their DiSC profile led to the situation at hand, with no real negative judgment. I try to lead the conversation on how we ended up at that place. Once in awhile, I may coach someone on how to smooth out their rough edges, but honestly, it rarely gets that far. Understanding that a conflict may be the result of personality differences usually helps all parties resolve it. In fact, it can also help you build a high functioning team where members recognize and celebrate the strengths of one another. 3. People are complicated. So, don’t reduce them to four letters. As you start to become more familiar with DiSC, take care not to break everyone down into mere letters and intensities. Even if this were possible, let’s do the math. On the classic DiSC profile scale, there are seven levels of intensity for each letter. That means there are 2,401 (7x7x7x7) different possible personality combinations distinguished by single point increments. Insecurity, arrogance, and different facets of intelligence make things even more complex, skewing what otherwise might be a fairly straightforward profile. Have you ever added just a dash of a spice into a recipe and had it change the dish entirely? My experience is that it’s the same with DiSC. I have been studying DiSC intensely on a daily basis for well over a decade with several thousand people. Yet, I know I’m just scratching the surface of personality complexity. The fact is, understanding DiSC is only the first step. It can help you to broadly understand what makes a person tick. I find that leveraging compassion and empathy to align my interests with co-workers and employees is the next step that unlocks even more value (with substantially more returns on your investment of energy). 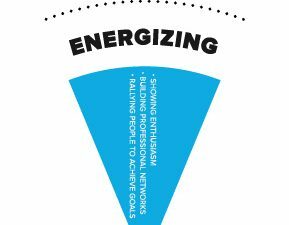 Thanks to DiSC, I am able to focus more energy on my natural strengths. I recognize when I should find a partner, a vendor, or an employee to help me do something better than I would have otherwise done a lousy job of on my own. I help my organizations to remain focused on results in similar ways. I help to minimize conflict through empathy-based DiSC principles and coaching strategies. I also evaluate investment opportunities based on the founders’ DiSC profiles and my determination of their commitment to overcoming any potential liabilities that come with these profiles. I know that everyone perceives information differently, so I tailor my feedback to people based on the understanding I have gained from their DiSC profiles. My understanding of DiSC also helps me to reduce the impact of Accidental Evil on my organization. (For more on this phenomenon, here’s a blog post I wrote on Medium). 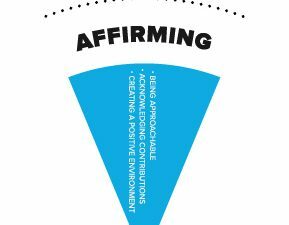 I’m convinced that none of these behaviors in isolation has much of an impact, but when knitted together into a cohesive philosophy, DiSC becomes a very powerful tool. The more you invest in it, the better and more effective you’ll become. Anyone can do it. Your progress can pay dividends, which when reinvested can lead to great personal and professional success — and help make the world a better place in the process. Casey helps organizations thrive by keeping founders focused on delivering value. He is Partner and Senior Software Engineer at Project Ricochet — a web development and design agency specializing in Drupal, Meteor, and Open Source projects. Casey believes in testing assumptions early and often. He puts that theory into practice as a software engineer, inventor, angel investor, writer, and speaker. 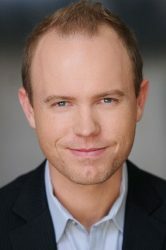 Check out his personal website or follow him on Twitter.